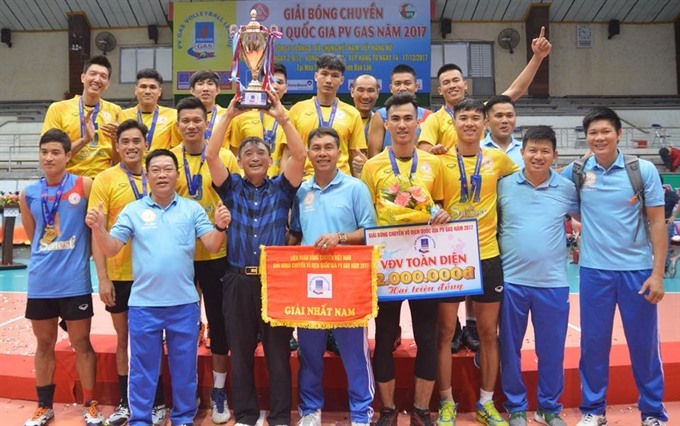 HÀ NỘI — The success of Sanest Khánh Hòa men’s volleyball team in recent tournaments is a proof of the power of training the young team. Beside the expertise, the team’s solidarity and bonds between coaches and players has brought victory for Sanest Khánh Hòa. After changing the formation and captain while at the same time building new strategy, it took the South Central Coast team only a short time to qualify in the National Volleyball Cup 2018 tournament. Needless to say, fans have never felt so proud as the team entered the final four of the tournament. Only a year ago, many youngsters had to play for other teams as mercenaries, while the rest had little chance to prove themselves despite their talents. Many players like Nguyễn Văn Phong, Lê Quang Đoàn, Dương Văn Tiên played well in the final round of PV – Cà Mau 2018 Cup, which ended on November 4. Hitter Nguyễn Đình Nhu once struggled to find a club, but under the training of head coach Thái Quang Lai, is starting to develop. The most regrettable for the team in this tournament was the lack of left-handed Nguyễn Quốc Đoàn due to injury. “I have had only received training from coach Lai recently but I found it so motivating and helpful,” said hitter Nhu. “Beside the expertise in the team, I feel I have found a place where I belong, finding myself in a real brotherhood to help when I have troubles in life. The coach and training board always care for me and other members. Therefore, I promise to devote all of myself to the team,” said hitter Nhu. Khánh Hòa really had many changes in personal technique, style and attack speed. The power of setters has been improved, with more tactics, and faster moves.